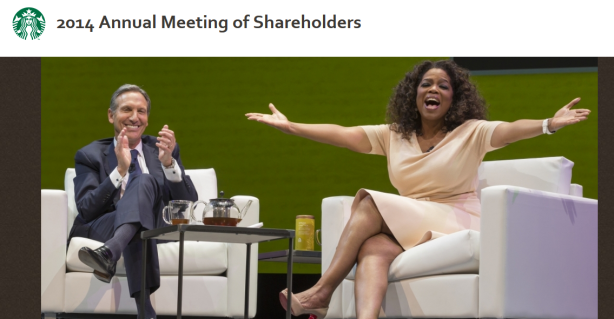 Starbucks developed a microsite to chronicle its annual shareholders' meeting, where Oprah Winfrey lent her star power to announce a collaboration with the company. SEATTLE: Starbucks developed a standalone microsite dedicated to its annual shareholders’ meeting in Seattle on Wednesday as an extension of the company’s digital newsroom. The site encompasses topics discussed at the meeting, including business highlights from the past year, its vision of growth, and where Starbucks is at in its ambition to build an "enduring" company, said Corey duBrowa, Starbucks SVP of global comms and international public affairs. "[The meeting’s goal was to] inspire shareholders, our [staffers], and the media that covers us, and to connect on a more personal level," he said. Starbucks chairman, president, and CEO Howard Schultz said at the meeting that after collaborating with Oprah Winfrey, Starbucks and Teavana stores in the US and Canada will start selling Teavana Oprah Chai Tea next month. The company will make a donation for each product sold to the Oprah Winfrey Leadership Academy Foundation to benefit educational opportunities for youth. The partnership with Winfrey highlighted the cornerstone theme of the meeting: that Starbucks is driving business through the "lens of humanity," according to duBrowa. "[Shultz] discussed how the company is redefining the role and responsibility of a for-profit public company in response to critical societal challenges," said duBrowa, mentioning the Create Jobs for USA and Come Together initiatives, as well as efforts to support military families. "All of these content pieces add up to Starbucks’ commitment to step into the fray on key social issues, provide our customers and partners with a voice, and not be a bystander." Other key initiatives from the past year include the launch of the Starbucks app for the iPhone, which allows customers to tip employees using mobile payments. The leaders of Starbucks in China and India also discussed the company’s growth plans in those countries. The chain also invited employees at the Starbucks Support Center in Seattle, to attend the event in person. DuBrowa added that one-third of the 3,000 attendees were Starbucks staffers. The meeting was also broadcast at viewing parties throughout the corporate office. Starbucks’ AOR Edelman worked on the planning and implementation of the meeting, with a specific emphasis on media engagement, according to duBrowa. "We reached out to local media, national and international beat reporters, and other key global media," he said. "We also offered select broadcast media the opportunity to interview [Schultz] and [Winfrey] about the Oprah Chai Tea announcement." More than 70 members of the press, including journalists from CNN, CNBC, The Wall Street Journal, and the Financial Times attended the event, as did representatives from several local outlets, he added.